This documentation describes the donor’s annual receipts page in detail. This page is accessed by the donor on the front-end of your site. In contrast to the Donation History page, or the Donation Confirmation page, this page does not have a dedicated shortcode that must be added to a page in order to be accessed. This is because this page is an extension of your existing Donation History page. Anywhere your donation history is output via the donation history shortcode, you will also see this notification above the Donation History page that provides a secure link for the donor to access their annual receipts. The annual receipts notice and link that is output before the Donation History page. NOTE: Just like the Donation History page, the Annual Receipts page is accessed only when the donor either logs into your website (if they have a user account connected to their donor record) or have requested access via the Email Access feature. This first section list the available PDFs by year. 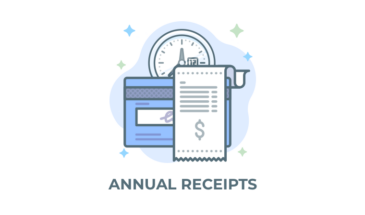 This provides the donor with an easy way to access, view, download, or print their annual receipts for their records and/or tax purposes. The next section lists the donors donations for a given year. The list of donations is filtered according to the years that are linked above the table. A screencast showing how the donations are filtered with the links above the donation list. Lastly, below the list of donations is a simple summary of the currently active year’s donations from that donor.